The cloth-like disposition of the upper unit allowed the foot to move naturally, according to some runners. The vibrant color options were appreciated by many. The toe box received some recognition from testers who felt that it was wide enough to accommodate natural toe-splaying. ‘Comfortable’ was a word that’s frequently used by users to define their running sessions while wearing this shoe. The Gel® Cushioning System gained renown among testers because it responsibly delivered cushioning and shock absorption. The mid-foot stability unit was able to correct over-pronated foot motion, wrote a number of testers who needed pronation control. A runner was pleased that it was versatile; it worked well for moderate distance running and trainings. A great number of consumers were impressed by its lightweight nature, saying that they didn’t feel as if the shoe dragged them down. A number of testers commented that the outsole’s traction capability was reliable. The toes of some testers tended to hit the upper fabrics frequently, causing holes to form on the shoe’s façade. The rubber material on the bottom started to peel off on some runners, significantly reducing traction. Several runners noted that this shoe wasn’t very comfortable for their feet; they claimed to experience discomfort in their heels and knees while wearing it. The Asics GT 1000 4 was a reliable stability shoe for many runners. Many stated that they were able to feel the mid-foot support unit as it stabilized their gait. It’s even adequately lightweight, allowing them to use it for their daily running sessions of the pavement. On the other hand, there were those who commented that the durability of this shoe wasn’t on point. The cushioning system left a lot to be desired for a number of consumers, as well. 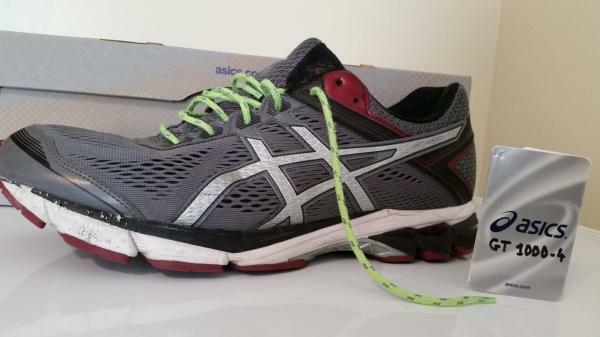 This is a review of an Asics shoe that has been around in one variation or another since the last century, probably because this is also a shoe that seems to agree with more types and sizes of runners than many other designs. Typical Asics construction is the highest quality! Improved in this version with a more durable upper that has not allowed my toes to wear, as with several earlier offerings of the GT-1000. Pictures show road wear at 300 miles and excellent workmanship and stitching. An excellent all-around shoe for running shorter distances but perhaps not the best choice beyond the half marathon without a change of the sock liner. Not as silent on the pavement as the Brooks Ghost and not as cushioned as the GT 2000 but just as fast. Slip-Grip Factor on wet pavement is excellent for such a long-wearing outer sole. Excellent reflectivity from the rear, with nothing up front so bring your own reflective shoelaces. Reflectors and lights help after dark. More so, I'm always ready to jump to the side while running facing traffic. Durability makes this shoe a great value. My running shoes always become work shoes for a second life at the Hardware Store. This is one shoe that needs NOT to be bought as soon as they come out to take advantage of the latest technologies. The GT 1000 is usually older technology to start with, so you can wait for year-end sales. Excellent shoe, always a little retro-dated which is no disadvantage to me as I like the SpEVA and less padding. With the addition of a better insert to bring more cushioning, this shoe can be taken anywhere, any distance. Some have mentioned that this would be a good starter shoe.I think that the Nimbus would be a good starter shoe while a shoe that is more nimble and simple such as this GT 1000-4 would be the shoe for the more experienced runner. Caution: the newer Asics GT 1000-5 has a lower toe box, a trend that goes with the 3D printing which must cost less than people sitting in front of sewing machines. This makes this version of the GT 1000-4 an even better value! The new upper combines two layers of mesh to provide support and breathability. The sole is lighter than ever before, but the structural integrity remains strong. A reasonably priced shoe that ticks all the boxes for a runner who needs support from their footwear. The 4th version of the Asics GT 1000 is a daily trainer that is optimized for the support of runners who have a moderately over-pronated foot motion. It features some reliable mid-sole mechanisms that guide the foot towards a more stable position when running and when standing idly. It’s made to support the runner at all times. The upper unit of the GT 1000 4 uses materials that deliver flexible, breathable and comfortable coverage. The engineered mesh looks like a woven cloth; it’s soft and it constantly encourages air to enter the shoe. The stitched-on Asics logo provides security and structure to the medial and lateral sides. The mid-sole unit employs reliable cushioning systems that offer bounce-back mechanics and impact protection. These components are high in quality, so they do not break down easily or lose integrity, even after many uses. A mid-foot support system is added to make sure that the foot is getting the balance that it needs when running on the roads. The stability mechanics prevent injury or discomfort brought about by the uncommon pronation of the foot. The outsole uses two rubber compounds to deliver protection and responsiveness to the runner’s performance. The rear of the shoe uses a tougher rubber that shields the sole unit from wear and abrasion while the forefoot section utilizes a softer rubber gives additional cushioning to each toe-off. The Asics GT 1000 4 is slightly larger than the regular measurements. It is recommended for runners to purchase ½ size smaller to get the right length. It is available in a medium width version, so it can accommodate runners with medium-sized feet. Its semi-curved shape allows the foot to acclimate naturally to it. Same as in the shoe's popular update, the Asics GT 1000 7, this shoe uses AHAR® or the Asics High Abrasion Resistant Rubber. It is a compound that’s placed in the heel section. Made from carbon rubber, it’s a very durable layer of protection that shields the sole unit from abrasion, wear, and the impact forces from the ground. It’s also able to deliver reliable traction over the roads. The DuraSponge® is a material that’s placed in the forefoot section of the Asics GT 1000 4. Made from the blown AHAR®, it has a more responsive nature as it gives additional cushioning to the runner, especially when executing a toe-off. The Gel® Cushioning System is a silicon-based mid-sole component that’s located separately in the heel and forefoot sections of the Asics GT 1000 4. It delivers impact protection when landing the foot on the ground, so each step is much more comfortable. The SpEVA® is a full-length cushioning foam that gives bounce-back characteristics. It’s made from a top-quality compound, so it doesn’t break down or lose structure easily. The Trusstic System® is a thermal plastic in the mid-foot that maintains the integrity of the shoe’s structure. It also reduces the overall weight of the shoe. The DuoMax® Support System is a dual-density material that’s meant to support the mid-foot to assume a more neutral stance when running and when standing idly. It carries the arch well and doesn’t let it roll inward, fully giving it structural support that’s helpful in preventing injury. The Engineered mesh is a lightweight, soft, yet durable material that resembles a woven fabric. It has an open construction, so it gives the runner consistent ventilation. It doesn’t compromise the natural flexibility of the foot because it moves like normal cloth. The inner sleeve is made from a soft material that lets the foot acclimate well to it when inside the shoe. It has a seamless construction, so it significantly reduces irritation and hot spots, which may cause blistering. The Asics logo is stitched onto the upper. Treated with a reflective coating, it heightens the visibility of the shoe, making it easier for the runner to trail in low-light conditions. It also provides structure to the upper unit while wrapping the foot securely. Additional cushioning is afforded by a Standard Sock Liner. It keeps the immediate underfoot platform as comfortable as possible for the runner.